Unlike jellyfish, they also have complex nervous and digestive systems with a brain, heart, and intestines. Salps feed through a mesh by pumping water through their bodies, whereas jellyfish will swim and capture things in their tentacles. Not only are these jelly blobs ancestrally similar to us, they form large chains of clones which break up to reproduce and then form more chains. So yes, they do sound like aliens! While jellyfish research has increased due to growing concern about larger amounts of the creatures in the oceans. 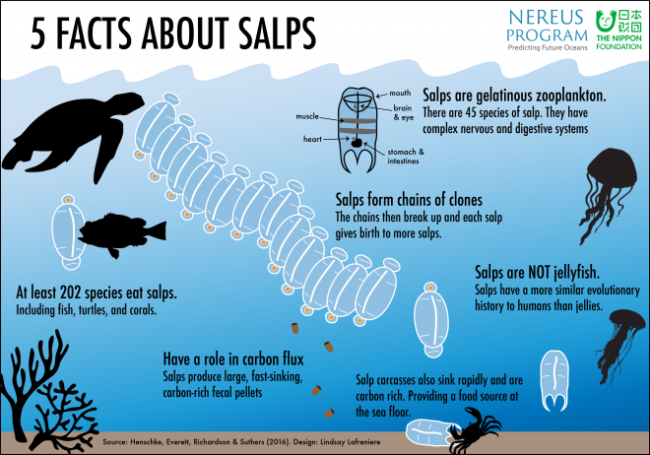 Henschke’s paper notes that salps remain relatively misunderstood and understudied. The paper is a review of the literature available and the common misconceptions about salps. Among the misconceptions are that salps are jellyfish and that salps are rare. 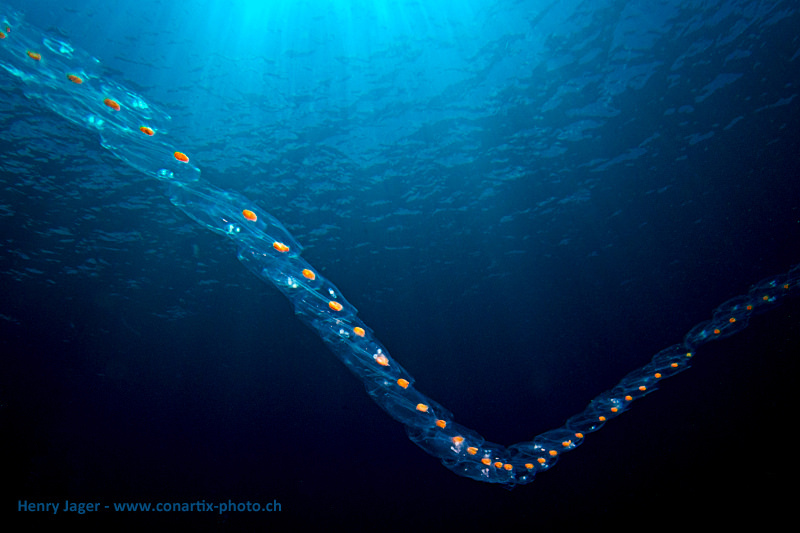 Salps are difficult to count because they are fragile and easily damaged by nets. But during a swarm, salps can cover an area up to 100,000 square km, with more than 5000 individuals per m3. Salps were also thought to be “trophic dead ends” meaning they have little caloric value as food for other species. Salps also contribute to ocean carbon fluxes and may be playing an important role in the biogeochemical cycle. It is now generally thought that overfishing and climate change are leading to larger amounts of jellyfish in the oceans, but Henschke encourages researchers to think about how salps might be affected.